Sigmund is an intelligent, highly affectionate companion. 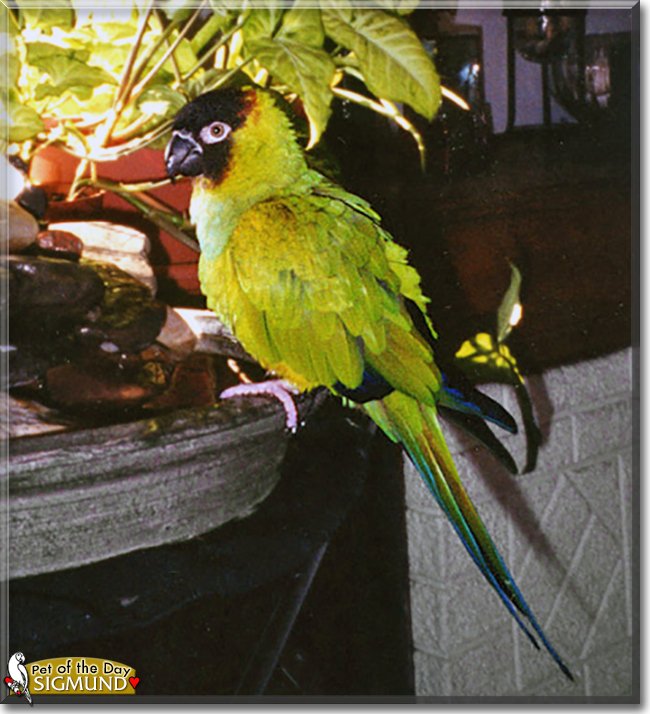 We had Sigmund for several years when she surprised us by laying eggs. By then, of course, she knew her name, so we didn't change it. She is not only female, she is very motherly. She has even been very nurturing to her infertile clutches of eggs that she has laid on pretty much a yearly basis. Sigmund has many talents. She can say "hi," "baby bird" and "up" along with her repertoire of various whistles. Sigmund has a good sense of rhythm and will dance to the beat of music when the mood strikes her. Sigmund's most impressive accomplishment was learning how to break out of her cage at a young age. We quickly discovered why it is suggested that parrot cage doors have locks on them! Yes, that is locks - plural! Most people who aren't familiar with parrots are surpised at how affectionate Sigmund is. She loves to sit with us, especially if it involves snuggling! She is a dear companion whom we love very much! Talk about Sigmund in Pet Talk!